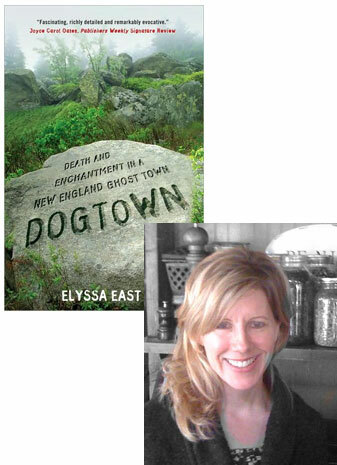 Elyssa East discovered Dogtown, the 3,000 acres of woodland surrounding the ruins of a colonial settlement adjacent to Gloucester, Massachusetts, through a series of paintings Marsden Hartley had done of its landscapes in the 1930s. “Initially I was just curious because they didn’t look like the United States,” she said of the paintings during a recent conversation. “They looked like a far-flung section of the Outer Hebrides.” As she researched the backstory behind the work, she was “stunned” to learn about how Hartley credited his time at Dogtown with healing him from a depression he firmly believed would otherwise have killed him. She was fascinated by the idea that a location could exert an influence so strong as to actually change our lives, and as local resident echoed a belief in Dogtown’s power, her interest grew—moreso as they began to specifically assert a negative influence, many of them referencing a savage murder that had taken place in the forest in 1984. “The degree to which people began to identify the place with the tragedy astounded me,” East confessed. One man openly suggested to her that Dogtown influenced the murderer; other people were more reluctant to put that on the record, but the idea was definitely there. If you live in New York, you can hear for yourself tomorrow night just how effective East’s powers of observation were—she’ll be reading at KGB with Oona Patrick as part of the Paragraph reading series.